Happy Birthday, Meg! Keep cranking out the great stuff. Meg, I couldn’t have made up the word “jook” if I had wanted to … Laughing here – Happy Blogday! Jook is the Korean version of congee, right? I love the stuff! And you make it with boar? um…YUM!!! Happy B-day to your delicious web site! Bacon RAWKS! Katy, It is a very strange word, but that’s what I grew up calling it! Joey, Thanks and cheers to bacon! Bill, I’m actually Chinese and we’ve always called it jook in my family. 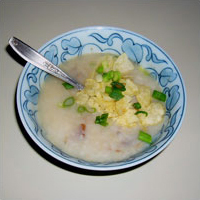 But it seems to be MUCH more commonly called congee. I must say, it was very, very good made with leftover wild boar bones!! Happy one-year anniversary to your awesome site Meg! Thanks Reid! I’m glad you enjoy my site. I feel so bad about those recommendations… your time at Salumi sounded awful! hi! i’m sorry i missed this post somehow. 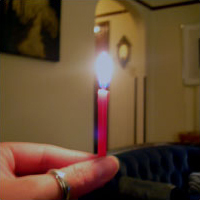 happy anniversary/blog birthday to the becon blog i heart the most! sheesh. i can’t believe i misspelled “bacon” here, of all places. Ha ha! Thanks Santos! I’m emailing you right now about the ice candy bags. How fun! Happy Birthday to Bacon (I heart)! Late as usual. But there better be booze still left at the open host bar, goshdernit!! You’re the best, girly-girl!! Thanks Eddie! The booze is long gone… but we can always buy more.